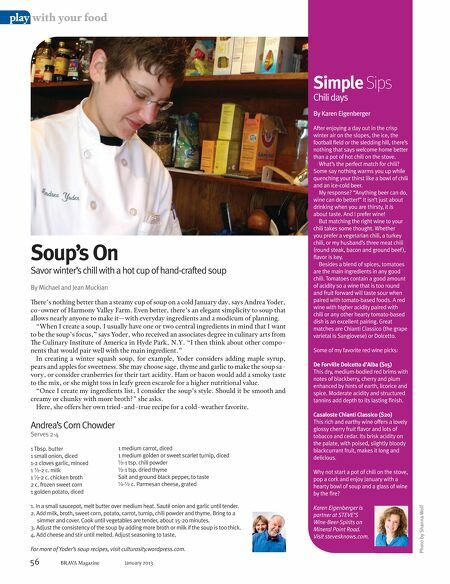 play with your food Simple Sips Chili days By Karen Eigenberger Savor winter���s chill with a hot cup of hand-crafted soup By Michael and Jean Muckian There���s nothing better than a steamy cup of soup on a cold January day, says Andrea Yoder, co-owner of Harmony Valley Farm. Even better, there���s an elegant simplicity to soup that allows nearly anyone to make it���with everyday ingredients and a modicum of planning. ���When I create a soup, I usually have one or two central ingredients in mind that I want to be the soup���s focus,��� says Yoder, who received an associates degree in culinary arts from The Culinary Institute of America in Hyde Park, N.Y. ���I then think about other components that would pair well with the main ingredient.��� In creating a winter squash soup, for example, Yoder considers adding maple syrup, pears and apples for sweetness. She may choose sage, thyme and garlic to make the soup savory, or consider cranberries for their tart acidity. Ham or bacon would add a smoky taste to the mix, or she might toss in leafy green escarole for a higher nutritional value. ���Once I create my ingredients list, I consider the soup���s style. Should it be smooth and creamy or chunky with more broth?��� she asks. Here, she offers her own tried-and-true recipe for a cold-weather favorite. Andrea���s Corn Chowder Serves 2-4 1 Tbsp. butter 1 small onion, diced 1-2 cloves garlic, minced 1 ��-2 c. milk 1 ��-2 c. chicken broth 2 c. frozen sweet corn 1 golden potato, diced 1 medium carrot, diced 1 medium golden or sweet scarlet turnip, diced ��-1 tsp. chili powder ��-1 tsp. dried thyme Salt and ground black pepper, to taste ��-�� c. Parmesan cheese, grated 1. In a small saucepot, melt butter over medium heat. Saut�� onion and garlic until tender. 2. Add milk, broth, sweet corn, potato, carrot, turnip, chili powder and thyme. Bring to a simmer and cover. Cook until vegetables are tender, about 15-20 minutes. 3. Adjust the consistency of the soup by adding more broth or milk if the soup is too thick. 4. Add cheese and stir until melted. Adjust seasoning to taste. For more of Yoder���s soup recipes, visit culturosity.wordpress.com. 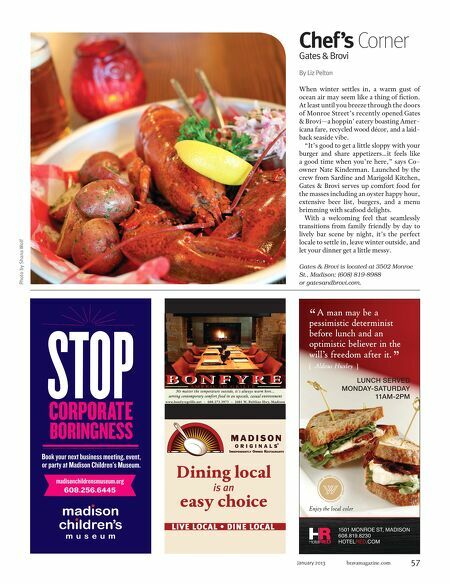 56 BRAVA Magazine January 2013 Some of my favorite red wine picks: De Forville Dolcetto d���Alba ($15) This dry, medium-bodied red brims with notes of blackberry, cherry and plum enhanced by hints of earth, licorice and spice. Moderate acidity and structured tannins add depth to its lasting finish. Casaloste Chianti Classico ($20) This rich and earthy wine offers a lovely glossy cherry fruit flavor and lots of tobacco and cedar. Its brisk acidity on the palate, with poised, slightly bloody blackcurrant fruit, makes it long and delicious. Why not start a pot of chili on the stove, pop a cork and enjoy January with a hearty bowl of soup and a glass of wine by the fire? Karen Eigenberger is partner at STEVE���S Wine-Beer-Spirits on Mineral Point Road. Visit stevesknows.com. Photo by Shanna Wolf Soup���s On After enjoying a day out in the crisp winter air on the slopes, the ice, the football field or the sledding hill, there���s nothing that says welcome home better than a pot of hot chili on the stove. What���s the perfect match for chili? Some say nothing warms you up while quenching your thirst like a bowl of chili and an ice-cold beer. My response? ���Anything beer can do, wine can do better!��� It isn���t just about drinking when you are thirsty, it is about taste. And I prefer wine! But matching the right wine to your chili takes some thought. Whether you prefer a vegetarian chili, a turkey chili, or my husband���s three meat chili (round steak, bacon and ground beef), flavor is key. Besides a blend of spices, tomatoes are the main ingredients in any good chili. Tomatoes contain a good amount of acidity so a wine that is too round and fruit forward will taste sour when paired with tomato-based foods. A red wine with higher acidity paired with chili or any other hearty tomato-based dish is an excellent pairing. Great matches are Chianti Classico (the grape varietal is Sangiovese) or Dolcetto.